Preheat oven to 350 degrees F. Line 16 muffin cups with liners, or spray with cooking spray. In a medium sized mixing bowl, sift together flour, cocoa powder, baking powder, baking soda and salt; whisk in sugar until combined. In a large mixing bowl, whisk together egg, oil, sour cream, milk and vanilla extract until well combined; stir in dry ingredients until just combined. Stir in cherries (I like to coat mine with a little flour and sugar) and chocolate chips until combined. Divide batter into muffin cups. Bake at 350 degrees for 20-25 minutes, or until cake springs back when gently touched in the center. 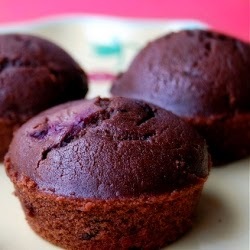 39 comments on "Cherry Chocolate-Sour Cream Muffins"
i'm hopelessly in love just looking at them! I too love to experiment with new flavors in recipes. I'm always experimenting. I know I would love these muffins. These are not boring by any means. Your posts are even fun to read when you're uninspired. I feel the same way, though; I think fruits are the most beautiful objects to photograph! This is like a truffle, but a muffin--I'm a fan of those chocolate covered cherries, big fan. I know I'd love these. Oh, I understand. These look so moist and good! oh darling sugar plumb! i love your posts. i'm so glad you share with us. i love that you invented these - and am VERY impressed with your oatmeal with peanut butter and banana. YUM. yea, i agree, food is so inspiring, and i talk about it way tooo much. love the photos as usual! I can COMPLETELY sympathize with what you are saying about loving to talk about food -- the taste, texture, beauty, etc. -- and people tuning you out. It is so frustrating sometimes when others don't become as excited as you over the sight of a perfectly, plump red tomato or cookies that came out of the oven cooked just right. P.S. I am eager to try out this recipe. It's like a baked cherry truffle...mmmm. These look like a real treat! Perfect for any day of the year! I hear you about the "foodie talk"...not everyone gets it. But we do! So keep it up ms genius! Those muffins look sensational, Em. You ARE a genius. Get yourself to cooking school NOW and you'll have plenty of people to talk to. You can always talk to me about food, i will listen. :-) hehe. I know the feeling though, sometimes people don't care how gorgeous the blood oranges are. How can they be so insensitive!? That cherry-chocolate combo looks seriously delicious. You're a genius! You really are! You have a passion for food, plain and simple. It's THAT, that will propel you to where you want to be in life, remember that. My family and friends sounf like yours do when I talk about food. But its what I love and we shouldnt curb it for anyone. This is the 2nd post I have seeen with chocolate and cherries. Which I much prefer to strawberries and chocolate. Shoot! I just put some chocolate muffins in the oven for breakfast before I came here. These look and sound super delicious. OK, that plate is just to cute and matches the muffins perfectly. Can people not appreciate that?? 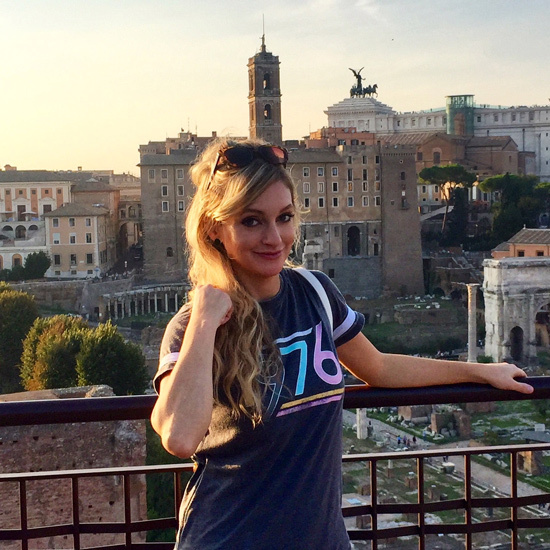 Sounds like you need to join a foodie forum like egullet. You can chat food to your hearts content. these little muffins are so cute i'm so in love and wanna eat them all up. somehow i think they're really cute and bouncy. i'm weird! :) anyway, i get those uninspired days too. in fact, i'm having an uninspired week. gosh. Oooh, this is my kinda muffin -- the type that definitely is a close relative to cake! These sound genius to me. I think you're pretty awesome and a very smart foodie. I'd be your friend and be excited with you about tangerines! ;)Sometimes I'm all excited about something and tell my husband and he just doesn't get it, he even doesn't get it when he tastes some of my creations! But I guess I don't "get it" when he talks to me all excited about his saltwater fish tank junk! Hi, I just stumbled across your blog from TasteSpotting on your oreo peanut butter rice krispie post and as soon as I saw your picture there I said, "No way!" to my husband. It was just incredibly ironic to me because we just watched you on the FoodNetwork Challenge a few hours ago. I just thought it was funny because of the timing. Anyway, we both thought you did an awesome job and your recipe's on the show looked awesome! Keep up your good work! you are a genius! Cory glazes over like every time I talk to him. So most of the time I just stop! Those muffins look great can't wait to try. I talk about food 24/7. I think my boyfriend wants to never hear about food. I am even worse because I go on rants about food politics. These look amazing. Keep up the food chat. 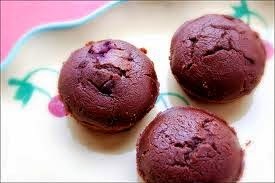 What a fab colour these have come out - you can see the chocolate and cherry colours merging into something truly yum. As for talking about food a lot, I think that is amazing - there are several people I know that can't even boil water and read my blog regularly. They are interested in reading about food even though they have never cooked anything. 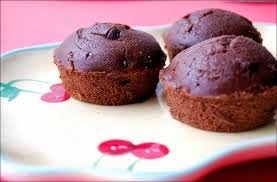 These muffins look amazing and so cute! I made these for a coworker and everyone loved them! Just pulled a batch of these out of the oven - they smell amazing! Thank you for a wonderful recipe!